Pacemaker spikes are usually very sharp and narrow. They may be difficult to see as some ECG machines can filter them out. 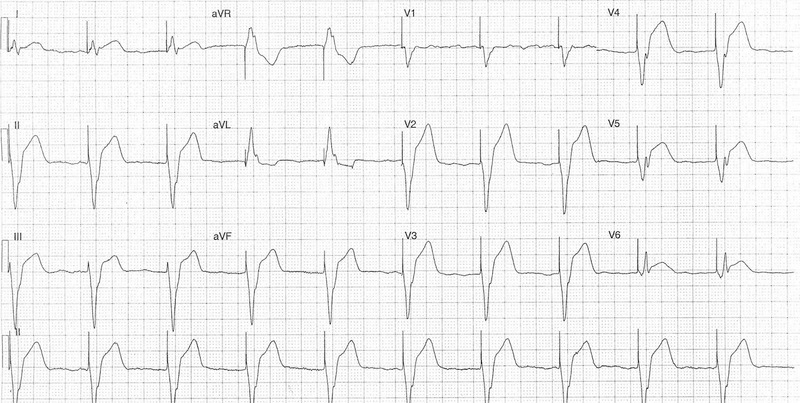 This ECG is from a man in his 90s who presented following an episode of syncope. This ECG is from a female in her 60s presented with 2-3 days of fatigue and shortness of breath. She called EMS when her symptoms acutely worsened while she was shopping. EMS arrived and recorded a heart rate of 27. On arrival to the ED she was noted to be in complete heart block. She was given atropine with transient increase in HR to 80s. This ECG was recorded after a transvenous pacemaker was placed. This ECG shows a paced rhythm with excessive discordant ST depression in lead I and borderline excessive ST elevation in III and aVF. The cause was an occluded proximal right coronary artery. This was missed and the patient died.